Webinar: Are we FAIR yet? Bio: Dr. Michel Dumontier is a Distinguished Professor of Data Science at Maastricht University. His research focuses on the development of computational methods for scalable integration and reproducible analysis of FAIR (Findable, Accessible, Interoperable and Reusable) data. His group combines semantic web technologies with effective indexing, machine learning and network analysis for drug discovery and personalized medicine. 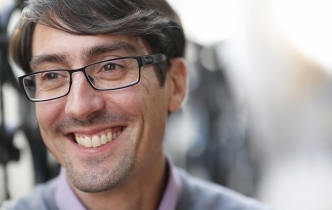 Previously at Stanford University, Dr. Dumontier now leads a new inter-faculty Institute for Data Science at Maastricht University with a focus on accelerating scientific discovery, improving health and well-being, and strengthening communities. He is a Principal Investigator for the NCATS Biomedical Data Translator, a co-Investigator for the NIH Data Commons, and a co-Investigator for the NIH BD2K Center for Expanded Data Annotation and Retrieval (CEDAR). He is a founding member of the FAIR (Findable, Accessible, Interoperable, Re-usable) initiative, a member of the Dutch Techcenter for Life Sciences, and is the scientific director for Bio2RDF, an open source project to generate Linked Data for the Life Sciences. He is the editor-in-chief for the IOS press journal Data Science and an associate editor for the IOS press journal Semantic Web. Wilkinson MD, Sansone S-A, Schultes E, Doorn P, Bonino da Silva Santos LO, Dumontier M. A design framework and exemplar metrics for FAIRness. bioRxiv 225490; https://doi.org/10.1101/225490 (2017).